Hey everybody! I'm getting ready to send out the patterns to the giveaway winners but I got distracted by seeing summer sewing plans on other blogs. Typical ADD kicking in for me. lol The weather here in Maryland has been increasingly summer-like and I'm realizing that my wardrobe is not well suited for the weather. I need to make a plan for things I need to carry me through the next 3 months or so. So, considering the above I already see the plan I need to make. I will be attempting to make some bottoms as I love shorts and capris in summer. It gets pretty hot here, especially in late June through July. Less is more, for sure, during that time of year. Also, the pool at my mother in-law's is open and I haven't gone swimming yet because my suit doesn't fit! That's just a crime! I need to make a bathing suit right NOW! I also need some shoes. After I broke my foot last August I haven't been able to wear shoes with flexible soles unless I can put carbon fiber plates under the insoles. I need to figure out what exactly I want and go from there with figuring out what I can find that in to work for my feet. I also need to buy a couple more bras. I finally found one that fits me like it was custom made for me: the Panache Tango II Plunge. I figure buying one a month until I have enough would be good considering my budget. 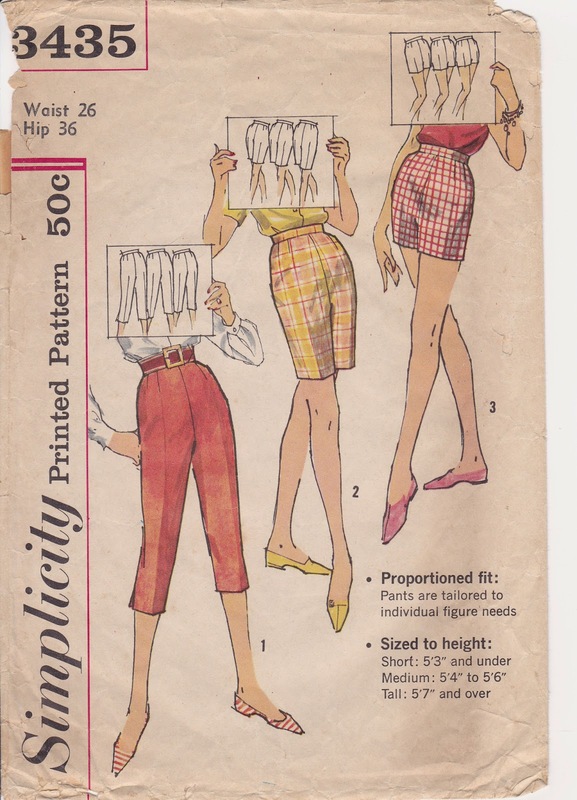 For the shorts and capris I will probably use Simplicity 3435 from the early 1960s. If I use the pattern I will be using views 1 and 3. I have some stretch cotton twill in navy and olive. The navy I have enough for the capris and maybe shorts. The olive I have enough for shorts. I'd like to get some khaki stretch poplin for the bottoms as well. The pair of capris I have are the perfect length for me. I'll be using them with the pattern to make sure the ones I make hit me where I like on my legs. I have some olive print ITY that is perfect for bathing suits in my stash. Have you seen the AMAZING Bombshell Bathing Suit pattern by Closet Case Files? The blue version is so 1950s glam! My jaw hit the floor when I saw it. It's exactly what I've been wanting to make for myself! I bought it right then and there. I also placed an order with Sew Sassy for lining, elastic and poly laminate foam to make my own cups for support (I just can't find any big enough for my girls). Closet Case Files is also hosting a sewalong. 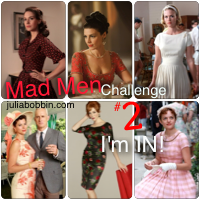 I'll be participating. If the olive suit turns out well I plan to make a leopard one and maybe a gold or copper lamé one. So, that's what I think I'll be sewing for summer. Right now on the table I have my Gatsby inspired robe to finish. It just needs the sleeves hemmed and a closure added. I want to do the lingerie I planned to go with it (vintage styled knickers and a bralette or cami) but the satin I bought is a nightmare to sew and I'm not sure I'm up for dealing with it right now. Luckily I have a lacy slip that will match the robe already. Other plans for the summer include hopefully going to the beach for a weekend with all the kiddos (step-kids, too) and I want to teach my almost 9 year old daughter to sew. I want to start with hand stitches with her then get her a very basic machine to learn on after she gets the hand stuff down. I also want to try to fix my serger. I think one of my loopers is bent. I got the serger for free so I don't want to spend anything taking it to a shop. I figure I like to tinker and figure out how things work so I'll try to fix it. It's already not working right so what do I have to lose? lol My job is going well. In mid-July I will be switching from day shift to night shift. I've never worked nights before, so it should be interesting. Hopefully I can adapt to it ok.
Do you have any sewing or crafty plans for summer? Or maybe winter if you are in the other hemisphere? Leave me a comment and let me know what you plan to make.